Xanthine/Hypoxanthine Assay kit (ab155900) is a product where Xanthine/Hypoxanthine is specifically oxidized by the Xanthine Enzyme Mix to form an intermediate, which reacts with Developer & Probe to form a product that can be measured colorimetrically (λ = 570 nm) or fluorometrically (Ex/Em = 535/587 nm). 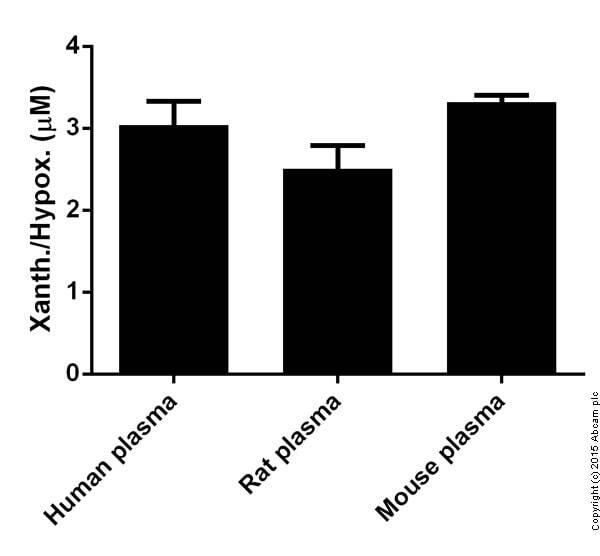 Xanthine/Hypoxanthine Assay kit is rapid, simple and sensitive. This high-throughput suitable assay kit can detect Xanthine levels as low as 0.4 µM in various biological samples. Xanthine, a catabolic product of purine metabolism, is present in body fluids, muscle tissue and certain plants. Structurally like caffeine, Xanthine has a stimulant effect and is used clinically to treat the congestive diseases such as asthma and chronic obstructive pulmonary disease. Xanthine is metabolized into uric acid and superoxide by Xanthine oxidase. Xanthine oxidase deficiency causes the rare genetic disorder-Xanthinuria, and leads to Xanthine accumulation in urine and blood, which ultimately progresses to renal failure. 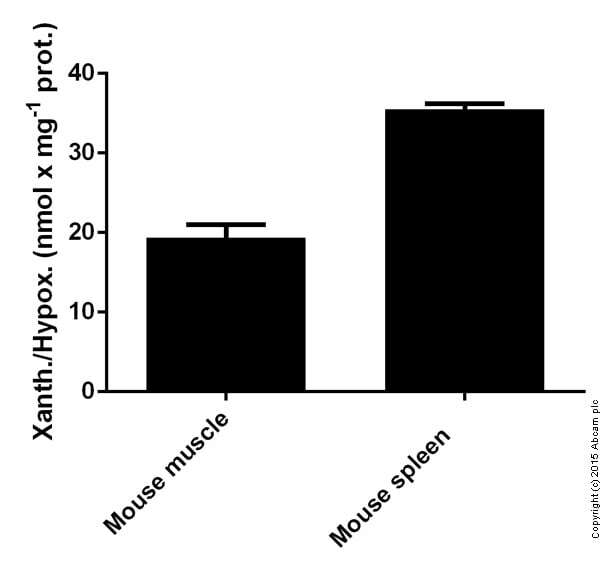 Recent studies show that Xanthine levels are elevated following ischemic injury, thus Xanthine can serve as a useful marker for tissue hypoxia. Early detection of Xanthine alteration in biological fluids is crucial for metabolic studies and for diagnostic and therapeutic monitoring. 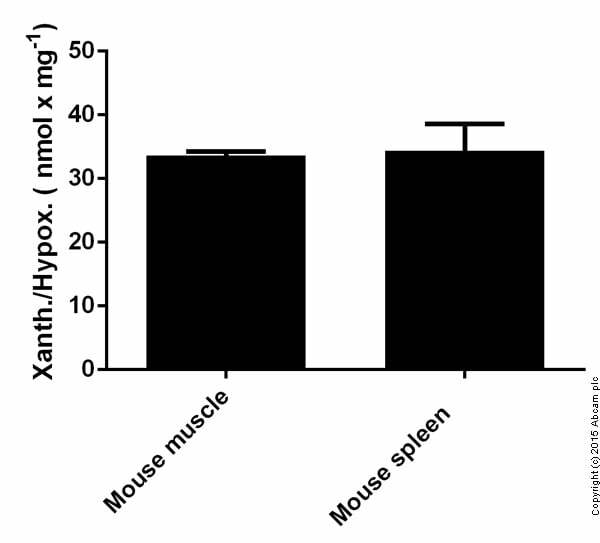 Xanthine & Hypoxanthine measured in mouse tissue lysates by fluorimetric method showing quantity (nmol) per mg of sample tested. Xanthine & Hypoxanthine measured in biological fluids by fluorimetric method showing concentrations (micromolar). Xanthine & Hypoxanthine measured in mouse tissue lysates by colorimetric method showing quantity (mmol) per mg of sample tested. Publishing research using ab155900? Please let us know so that we can cite the reference in this datasheet. Is there a recommended length of storage for samples to be used with this Xanthine/Hypoxanthine Assay Kit? I think more than the length of the storage, it is important that the samples are not freeze thawed multiple times.